KEMEROVO, March 26. /TASS/. Families of people killed in the fire at a shopping mall in Russia’s Siberian city of Kemerovo on Sunday will receive a compensation of one million rubles (over $17,500), Kemerovo Region Governor Aman Tuleyev said. "I have made a decision that each family, which unfortunately has one member dead, will receive one million rubles in compensation," Tuleyev said. "If there are two (family members killed in fire), God forbid, then it will be two million rubles. The decision has been made." The governor said that special groups of psychologists, social experts and doctors have been assigned for personal work with each family of the casualties in the tragedy. "We will be doing this work carefully, to avoid upsetting them, because people are perplexed at first. Our task is to help and support…," Tuleyev said. "All of this is also difficult for me personally, because one of my close relatives died there as well and unfortunately this relative was a little girl," the governor added. The fire at the Zimnyaya Vishnya (Winter Cherry) shopping mall in central Kemerovo erupted on Sunday on the top floor of the four-storey building engulfing an area of some 1,500 square meters. According to the most recent information, 37 people were killed, including nine children, and over 40 were injured in the fire. More than 60 people are missing at the moment, including 41 children. 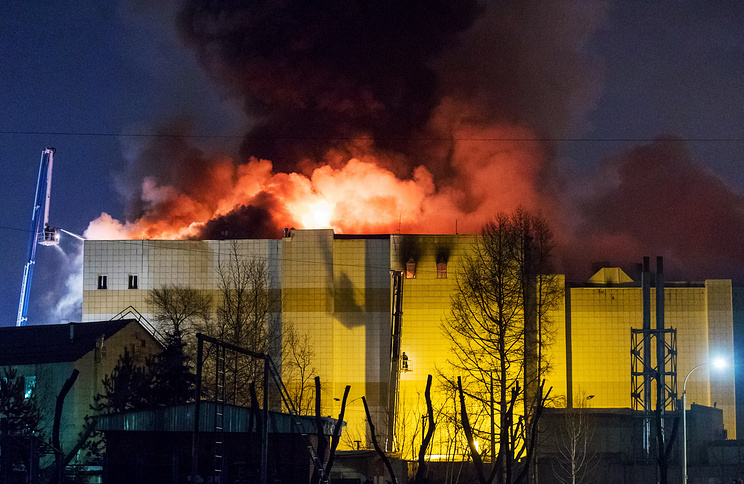 Vladlen Aksyonov, a Russian deputy emergencies minister, said earlier that floor decks of the burning four-storey shopping mall in the Russian Siberian city of Kemerovo may collapse as the fire keep raging at the facility. The shopping mall with an overall area of 23,000 square meters was opened in 2013. It has a parking lot for 250 cars, shops, a bowling alley, a children’s center, a cinema, food courts and a petting zoo.